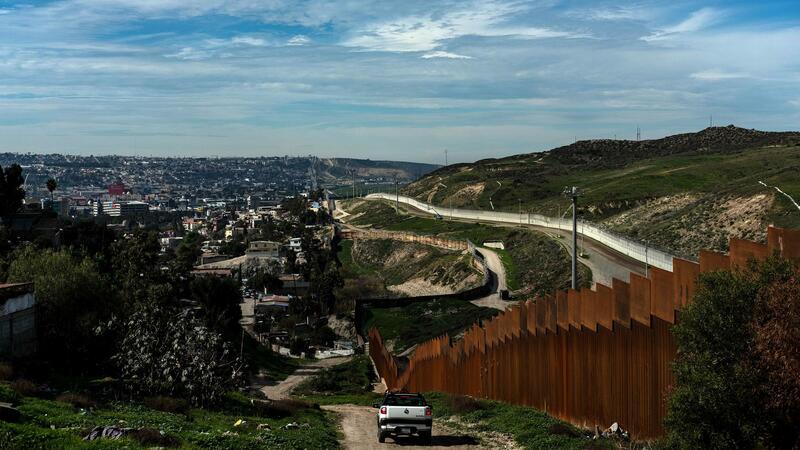 The U.S.-Mexico border fence in Tijuana, Baja California State, Mexico, is seen on Jan. 28. The White House said on Thursday that President Trump plans to sign an emergency declaration to get additional funds for a border wall. "President Trump will sign the government funding bill, and as he has stated before, he will also take other executive action — including a national emergency — to ensure we stop the national security and humanitarian crisis at the border," White House press secretary Sarah Sanders said in a statement. "The President is once again delivering on his promise to build the wall, protect the border, and secure our great country." By Thursday evening, Congress had easily passed the bipartisan spending deal, which had been crafted by lawmakers from both the chambers. The vote was 83-16 in the Senate and 300-128 in the House, constituting veto-proof majorities. While the president's decision removes the threat of another partial shutdown, it also raises the stakes in his push for a trademark border wall right as the 2020 presidential campaign is heating up. Trump's move to pursue additional funding for the wall through the declaration of a national emergency is an extraordinary and unprecedented possible use of presidential power — and one almost certain to elicit efforts to limit the executive branch's expansive authority over what constitutes such an emergency and how one is to be handled. Trump had seemed somewhat hesitant to sign the breakthrough deal that congressional negotiators reached in the wake of a previous 35-day shutdown, the longest ever in U.S. history. The proposal only includes $1.375 billion for border barriers and increases other border security funding — far short of the $5.7 billion Trump had demanded to make his signature campaign promise a reality. Many influential conservatives balked at that figure, which is what triggered Trump to back off an earlier similar funding offer in December that led to the partial shutdown. But now he will go along with the offer — by adding his own controversial terms. For some time, Trump has floated the idea of declaring a national emergency to secure the funding he desires, and it's an idea that Democrats and many within the GOP have cautioned him against, both for the potential precedent it would set and legal challenges it almost certainly will face. In a joint statement, House Speaker Nancy Pelosi, D-Calif., and Senate Minority Leader Chuck Schumer, D-N.Y., said an emergency declaration "would be a lawless act, a gross abuse of the power of the presidency and a desperate attempt to distract from the fact that President Trump broke his core promise to have Mexico pay for his wall." "It is yet another demonstration of President Trump's naked contempt for the rule of law. This is not an emergency, and the president's fearmongering doesn't make it one. He couldn't convince Mexico, the American people or their elected representatives to pay for his ineffective and expensive wall, so now he's trying an end-run around Congress in a desperate attempt to put taxpayers on the hook for it. The Congress will defend our constitutional authorities," the Democratic leaders said. Senate Majority Leader Mitch McConnell, R-Ky., was the first to make the announcement Thursday afternoon that Trump would back the legislative package. McConnell also said he would endorse the president's plan to declare a national emergency, even though the top Senate Republican seemed to previously warn against such a maneuver. "And he — I would say to all my colleagues that he has indicated he's prepared to sign the bill. He will also be issuing a national emergency declaration at the same time. And I've indicated to him that I'm going to support the national emergency declaration," McConnell said on the Senate floor. The $333 billion bipartisan spending package also funds a number of unrelated agencies that have become part of the overall spending fight. The bill also has restrictions on where the fencing can be built, including explicit protections for sites like a butterfly refuge in the Rio Grande Valley. McConnell and other top Republicans had urged Trump to sign it, with Iowa Sen. Chuck Grassley, the longest-serving Republican in the Senate, even invoking a high power after the daily morning prayer on Thursday. "Let's all pray that the president will have wisdom to sign the bill so government doesn't shut down," Grassley said before leading the chamber in the Pledge of Allegiance. At first, Democrats had celebrated the legislation as a victory over Trump's demand for $5.7 billion to build more than 200 miles of concrete wall along the U.S. border with Mexico. The final agreement includes a fraction of that funding for steel fencing that is similar to existing barriers elsewhere on the border. However, that victory was short-lived with the news of the emergency declaration, which Democrats have already indicated they would challenge in court. "I don't believe there's any good faith negotiations to have with Republicans if they're going to support the president doing an end run around Congress," Pelosi said in a press conference shortly after McConnell's remarks in the Senate. "So the precedent that the president is setting here is something that should be met with great unease and dismay by the Republicans, and of course we will respond when we review our options," Pelosi said, adding that "Republicans should have some dismay about the door that they are opening, the threshold they are crossing." California Attorney General Xavier Becerra said earlier this month in his Spanish-language response to the State of the Union that he would sue the Trump administration the moment the president declares a national emergency to free up funds for a border wall. "Any crisis on our border is of President Trump's own making: family separations, child detention, turning our backs on asylum seekers, and more. There is no national emergency. If Trump oversteps his authority and abandons negotiations with Congress by declaring a fabricated national emergency, we won't only call his bluff, we will do what we must to hold him accountable," Becerra said in a statement Thursday. "No one is above the law." There could also be a way Democrats in Congress could seek to invalidate any emergency declaration. Speaking to reporters, Sanders dismissed any possible legal challenges to the emergency declaration. "We are very prepared but there shouldn't be [any challenges]," the White House press secretary said. "The president's doing his job. Congress should do theirs." Sen. Lindsey Graham, R-S.C., a Trump ally, said in a statement that this was the right move from the president. "The budget deal is a down payment on the wall, provides funding for more immigration judges, and does not include a cap on detention beds for violent illegal immigrant offenders," Graham said. "It's now time for President Trump to use executive power, including declaring national emergency, to build the wall." "I've heard the arguments that it will be the end of Western order, and I don't believe that. I've heard the arguments that it sets a precedent, as if future presidents wouldn't be smart enough to know they have this option. The president isn't exercising any power that Congress didn't give him," said Sen. John Kennedy, R-La. "I don't know how he is going to structure it. It may be there will have to be a vote of Congress. Almost surely someone will try to tie it up in court." Other senators, however, sounded more skeptical. "My concerns about an emergency declaration were the precedent it would establish," said Sen. John Cornyn, R-Texas. "I also thought it would not be a practical solution because there would be a lawsuit filed immediately and the money would presumably be balled up associated with that litigation. I thought there were other, better alternatives." "I generally don't think that's a good approach but we'll have to deal with it and see what can be done about it," Sen. Marco Rubio, R-Fla., said of the impending national emergency declaration. "But again I want to see what he actually does." "In general I'm not for using emergency powers because I think the Constitution is very clear at very — trying to separate the powers. And if we start naming things as emergency, very quickly we lose things — sort of the checks and balances of government," said libertarian-leaning Sen. Rand Paul, R-Ky. The homeland security funding bill would also reduce the number of immigration detention beds from roughly 49,060 to roughly 40,000 over the course of a year. Detention beds became a major issue in the negotiations after Democrats sought to curb aggressive immigration enforcement in exchange for more overall spending on border security. The legislation also includes a number of funding changes for programs ranging from border security to energy and environment. It includes $9.3 billion for the Environmental Protection Agency and the Land and Water Conservation Fund, $17 billion in new infrastructure funding, a $1.8 billion spending increase for the 2020 census and a 1.9 percent pay raise for federal workers. However, negotiators were unable to agree on a number of priorities they hoped to add on to the spending bill. Talks broke down over a measure to provide back pay for federal contractors who missed paychecks during the last shutdown, according to several aides familiar with the talks. That failure forced them to abandon all unrelated policies, like funding for disaster aid and an extension of the Violence Against Women Act. Leaders plan to try to address those issues separately, and grants under the Violence Against Women Act will continue to be funded, according to several leadership aides.